Some of you know Pauline Prawdzik as mom, great grandma, auntie, cousin, friend, golfing partner, and to me, and 12 other grand children, she was grandma. 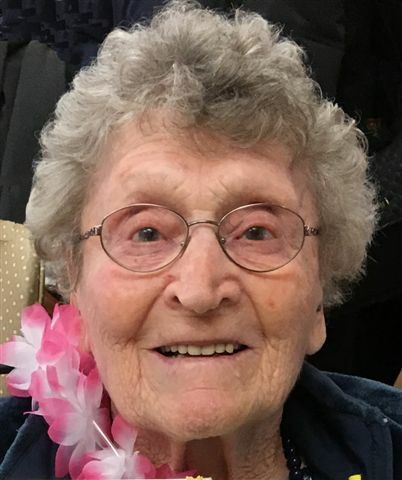 Peacefully on March 25th, 2019, Pauline Prawdzik passed away at the Neepawa Memorial Hospital, with her family by her side. Grandma’s parents John and Mary Makowaychuk were born in the Ukraine, moved to Canada and had 11 children. Grandma was born in 1925 in Minnedosa, and moved to Mountain Road shortly after where she grew up. On October 4th, 1947, grandma married Stanley Prawdzik at St. Mary’s church in Mountain Road. Then they moved to Toronto where grandma worked in a sports factory honing her sewing skills. Grandma and Grandpa later returned to Manitoba, and settled into their house on highway 5, in Neepawa where Grandma worked at the drive-in movie theater, Edson Industries and eventually opened up her own business in her basement, Neepawa Drapery. Grandma and Grandpa had 5 children, Terry, John, Wayne, Debbie, Jacquie, and a foster daughter Velma who lived with them for many years. Grandma spent countless hours either in the garden, on the lake fishing or out on the golf course. Many of us grand kids have fond memories of grandma taking us golfing, being her caddy, driving her golf cart around, and going for ice cream while spending time at the cabin at Clear Lake. It seemed the kitchen at grandma’s house was something that brought us all together. Christmas, and Easter dinners every year, it would be pretty hard to estimate how many perogies and cabbage rolls were made and eaten in grandma’s kitchen over the years, the many cassette tapes of polka music that were played, or the buckets of golf balls that were hit into that field beside her house (or the many, many hours spent searching for them afterwards.) It was widely known that if you turned down dessert, grandma would give you two desserts instead. Even on a busy perogy making day every inch of the house would be covered in perogy trays, grandma would always make sure her grandkids were able to get a new batch of perogies for lunch followed by a fresh bowl of raspberries with cream. Another thing we will always remember is how much Grandma liked to give smooches when you were leaving, and her phrase “I’ll love you and leave you”. Even though some of her grandchildren lived in other parts of the country, they still remember going golfing with grandma, and spending time with her during summer vacations. In 2005, grandma moved into Kinsmen Court, where she kept up with the odd round of golf, and trips out west to see her sister Margaret and son John in BC. Then in 2015, grandma moved into Country Meadows Care home, where she spent her remaining years. Grandma leaves to mourn son Terry and his wife Rosalie, and their children Sean, his wife Anita and their child Paige, Samantha, Son John and his wife Joanne, and their children Matthew, Luke, and Joshua. Grandchildren Michael, Steven, and Rachel, and her husband Ryan, Daughter Debbie and her husband Keith, and children Jody, Kerry and Kevin, his wife Becky, and their children Averi, Kooper, and Oaklyn, Daughter Jacquie and her husband Graham, and their children Jesse and his wife Aydra, Katharyn and Eric. Grandma is predeceased by her husband Stanley and son Wayne, his wife Angie, and numerous other family members. Grandma was a founding member of the St. Dominic’s CWL, and a devout member of the St. Dominic’s Catholic Church.